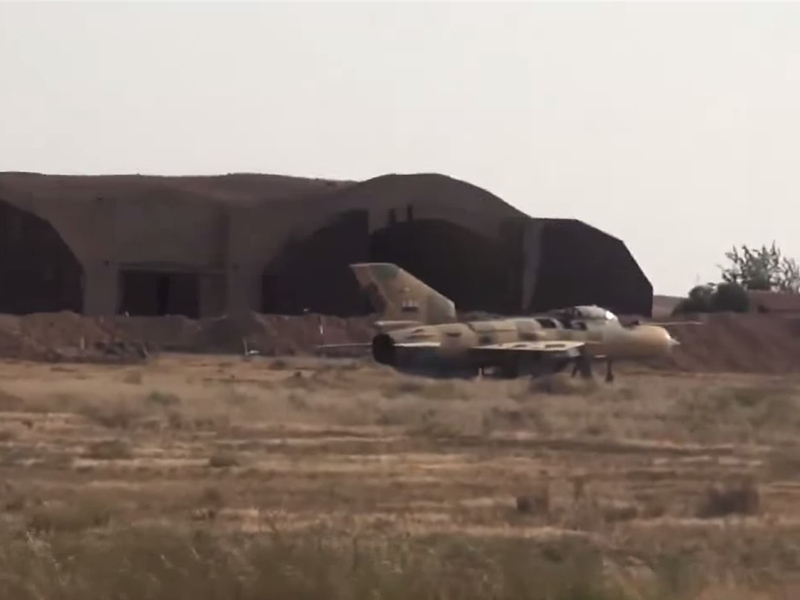 ISIS' alleged fighter jet fleet dwindling? DAMASCUS -- If the Islamic State of Iraq and Syria (ISIS) was learning to fly stolen Syrian fighter jets, it may have seen its fleet of three reduced to just one "ineffectual" aircraft. CBS News' George Baghdadi reports Information Minister Omran Zoubi said late Tuesday that Syrian military aircraft had shot down two of three fighter jets allegedly stolen by ISIS as it rampaged across northern Syria seizing army and air bases in the Aleppo region. The Syrian Observatory for Human Rights (SOHR), a U.K.-based organization which relies on an extensive network of sources and activists inside Syria, said on Friday that defected Iraqi military officers were teaching members of the terror group how to fly three commandeered jets at the al-Jarah air base in rural Aleppo. Asked about the SOHR report, the U.S. military said it was unaware of ISIS (also known as ISIL) flying fighter jets "in Syria or elsewhere." "We continue to keep a close eye on ISIL activity in Syria and Iraq and will continue to conduct strikes against their equipment, facilities, fighters and centers of gravity, wherever they may be," U.S. Central Command spokesman Colonel Patrick Ryder told the Reuters news agency. But the Syrian government did apparently take the report seriously, and Zoubi said Wednesday in a televised interview that his nation's military had gone "immediately and destroyed two of them on the runway while they were landing." Zoubi said the third alleged ISIS-controlled aircraft was "hidden and we are currently searching for it and we are going to destroy it as well." The Information Minister was dismissive of any threat posed by ISIS having the aircraft, saying the Syrian government was "not worried" because it didn't believe the militants could make use of the stolen jets. He didn't explain why the government believed ISIS couldn't use the aircraft. Zoubi also suggested the entire story about the stolen aircraft was really just an "excuse to impose a no-fly zone" in sections of Syrian airspace. Flash Points: Are U.S. air strikes enough to combat ISIS? "The target from the whole issue was to give a pretext to (Turkish President Recep Tayyip) Erdogan to set up a no-fly zone. This is ridiculous. It is a nonsense story that has fallen and no one is going to discuss it anymore," he said in reply to a question. U.S-led forces have been bombing ISIS bases in Syria and Iraq for weeks. The group has regularly used weaponry captured from the Syrian and Iraqi armies and has overrun several military bases. Photos and video of jets captured by ISIS have appeared on social media accounts, but only one video -- which surfaced Monday on YouTube but was quickly deleted by the video website - purported to show one of the stolen jets being flown by the militants. That video could not be verified, and in the vast majority of other images showing stolen aircraft, the planes appeared to be in unusable condition. ISIS controls a large swath of territory in eastern Syria, where a civil war pitting various rebel groups including ISIS against the regime of President Bashar Assad -- and against each other -- has raged for more than three years.